Thats what Josh Paurini (New Zealand), a crew member for one of the participants at La Ultra – The High had to say. Josh himself is a trainer who, to get the best out of his clients, is happy pushing them to their limits and beyond. 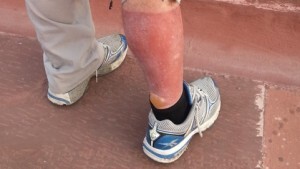 There isn’t any other ultra marathon out there in which sun burn (check pic below) and frost bite can happen at the same time. In peak summers, on a very regular basis, you can have snow fall and blizzard. Not surprisingly then, adventure wing of the Indian Army dubbed it as an impossible run. Very good ultra runners commented that they like tough events, but a dangerous event is pushing it. The very civilian ultra-runners from across the world have done it over 4 years running now. We make a dangerous project tough, for which very dedicated people are put into place year on year. Just to give you an idea, for 7 participants, we would have 50 plus crew and support staff, with 15 plus vehicles. Unlike other ultras, we have high altitude sickness, that can be fatal. We don’t take any chances. To call La Ultra – The High an extreme ultra marathon is an understatement. It is held in Leh-Ladakh region of Indian Himalayas. It is a distance of 222 km, crossing 2 mountain passes over 17,400+ ft (5300+ m), with a cumulative elevation of 13,313 ft (4,057 m), to be covered in 2 days (48 hrs) on feet. The oxygen content of air can at times be as low as 60 percent that of sea level. Temperatures can vary on the course from 40 degree celsius to minus 10 degrees. Each year we handle medical conditions that would make even the ER doctors sweat. This event pushes limits for all involved. Qualifications and training are very important, but your mindset is far more important. Almost all of us trained to make very good decisions in controlled conditions. However, for some, once thrown outside a comfort zone, can’t tackle even basic things. The medical crew is expected to acclimatise to high altitude, for which they need to be in Leh for 11 days prior to the event. There is a simple logic behind this: if you aren’t fit yourself, how do you expect to take care of anyone else. Also, high altitude sickness has no logic. It can hit the fittest of us, and not bother the most obese. You simply need to rest and acclimatise. Even if you happen to be an ER doctor, it’s almost in air-conditioned rooms, with back up support just a phone call away. Not at La Ultra – The High. There is a good chance you could have not slept for two to three days. On top of that, the very first important symptom of high altitude sickness is the inability to make correct decisions. Now imagine being thrown into a place where your phones and internet don’t work, let alone walkie-talkies. There is no helicopter evacuation service. Extreme ranges of conditions have you on an edge all the time. These circumstances can make even the most balanced folks break down, literally. Wilderness medicine is actually about being in middle of nowhere and figuring it out yourself – with no expectation of back up. On top of that, understanding the event and why people want to do these crazy things. Participants at the start line are some of the very best ultra runners in the world. These participants know what they have got themselves into. They normally would have trained six months exclusively for this event alone. They want to finish it. Your role is to help them achieve it but not at the cost of their life. They are there to push the human limits. We doctors, honestly have no clue what that means. We have simply been trained to deal with illness and sickness. As Professor Timothy Noakes has explained for three decades, it’s not physical limitation that draws out our boundaries. It’s the brain, the central governor. We need to understand that a lot more. During this year’s edition, we had Ryoichi Sato (52 years) from Japan, a veteran ultra runner, who has run 74 tough ultra marathons around the world. Just 2 months prior, he had a pace-maker set in (read post run interview HERE ). He rightly was very apprehensive about this crazy run. Last year he had run the marathon (42.195 km) in Leh. So he did have prior knowledge of the conditions. He wasn’t simply being nervous. He’s also suffered with back pain for over 23 years now with disc bulges at 2 levels in lower lumbars. During one of his training runs up Khardung La, world’s highest motor-able mountain pass, a tourist tripped on his knee, while trying to fit the whole Himalayas into his camera by moving backwards. This twisted Ryoichi’s knee, which later gave him a lot of grief during the run. Now trying to understand Ryoichi. As mentioned earlier, he’s a seasoned ultra runner. He knows what his body can take in extreme endurance events under strenuous conditions. A Pace-maker is new to him. As Professor Noakes mentions in his book, Challenging Beliefs: Memoir of a career, “athletes regularly change the intensity at which they exercise – indeed, we know that this happens on a stride-to-stride basis in running or with each pedal stroke in cycling. In essence, with each new stride in running the brain must make one of four choices: continue at the same pace, slow down, speed up or stop altogether.” Ryoichi’s brain understands what intensity for him is optimum and how to play best with the four gears mentioned above by Prof Noakes. When Ryoichi shared the information of his Pace-maker and current condition with me, I recognized the importance of keeping calm. I was like, “Ryoichi, it’s not a big deal. We’ll go by what you feel. If you simply go slower than your regular pace, and put lesser strain on your body, it’ll be all-good. But you need to be honest with yourself about this. At all times, keep me informed about your status.” My calm response gave Ryoichi confidence in himself and he knew his game plan. I could have stressed him out. His brain would have gone crazy with thoughts that were already bothering him. That ‘central governor’ would have told the heart to be more stressed out sooner, effectively leading to reduced efficiency or a fatal incident. Ryoichi’s back and knees were bothering him from five hours into the run. On at least four occasions, I gave him manual therapy treatment while on the course. Just picture a full moon night, lighting up the Himalayan range and you are on the road, literally, treating a patient with your hands. Now, it’s all worthwhile. No picture could ever cover this scene. No amount of words could explain how amazing it felt to help someone in such basic conditions. I mention this because most of us haven’t been trained how to use our hands. When you are out there, you need to know how to make do with anything that you have around. At times, your hands are the only tools you have. Also, I would think most doctors would have pulled off Ryoichi. It was very clear for me. His lungs were clear and he had no signs of high altitude sickness. He had muscular issues, which he already had a history of. I was more than happy to go beyond the ‘line of duty’, which in any case is very blurred during this event. Just to make it more interesting, for 2014 edition (5th version), 333 km crossing 3 mountain passes over 17,400+ ft in 3 days is being introduced. We are pushing the human limits yet again and looking for crazy doctors who get excited by this. If this still interests you, do write back to us (laultra@thehigh.in) for the next year’s edition. If you or your institution wants to collaborate for research, that’ll be awesome. I can promise you two things. It’ll be by far the biggest learning of your life. And it’ll make you a far better doctor or physiotherapist.